A hearty soup made with potato, red pepper, celery salt, corn and smoked paprika. It's vegan, made with coconut milk and so delicious! Soup season might be coming to a close, but before it does – you must try this one. 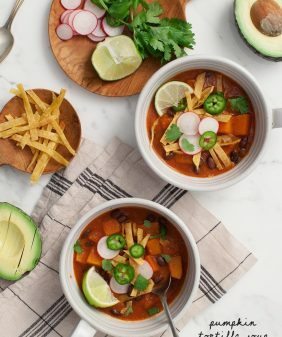 It’s hard for me to pick favorites, but this is definitely one of my favorite soups I’ve made on this here blog thus far. I don’t care what temperature it might be outside, I could eat a bowl of this creamy, smoky corn chowder anytime. As always, this is creamy without using heavy cream. The trick is to use fresh sweet corn. After you slice off the kernels, use the back of your knife to scrape the juices off the cob. I realize most of you don’t think of spring as the time for fresh corn – but it turns out that it’s actually peak season for Sunshine Sweet Corn. You don’t have to look hard to find it – it’s the kind that’s at your grocery store right now. I like to buy it in the husks because it’s the most fresh. In addition to the corn, this soup has chopped yukon gold potato, diced red pepper and a can of light coconut milk (although the end result doesn’t have a coconut taste). It’s seasoned with celery salt and smoked paprika for a rich smoky flavor. I blended half the soup, and mixed the blended portion back into the chunky half for the perfect hearty texture. Since corn cooks so quickly, this one is pretty fast and easy to make. Heat the olive oil in a large dutch oven over medium heat. Add the onion and a few pinches of salt. Cook until soft, then add the garlic, celery, and potatoes. Slice the kernels off the corn, then use the back of your knife to scrape the juices off of the corn cob and add to the pot. Add the red pepper, celery salt, paprika, a pinch of salt, black pepper, and stir. Cook until the potatoes are slightly softened, about 5 minutes, then add the sherry vinegar, vegetable broth, and coconut milk. Cover and simmer until the potatoes are tender, about 15 more minutes. Let cool slightly, then transfer half the soup to a blender. Blend until creamy then return it back to the pot and stir. That looks delicious! Love that there is no actual cream! I love corn chowder! I have to try this one out, LOVE that it is vegan. Loving these vegan options! Yay! I usually have to avoid chowders because they’re always packed with cream. This is a great workaround! This is perfect! I had wanted to make a corn chowder this week but could not find a recipe I liked. It’s like you read my mind (+ you made it vegan). What do you think about adding zucchini to this? I have some and love it with corn but I’m worried it might make the soup too watery. It might make it too watery, I’m not sure. This one’s pretty good exactly how it is 🙂 Let me know if you give it a try! Oh my gosh! This chowder looks amazing! It looks so beautiful & light! The perfect spring soup! I cant wait to give this a try! My husband is a big corn chowder fan! Oh this is love… I can just tell. I’ve been wanting to make a vegan corn chowder for awhile now (funny enough), and you just took all the work out of it for me! Yay! Cannot wait to devour this one. This is gorgeous! I love that it’s vegan and the use of paprika to create that smokey flavor is awesome. I know, I LOVE smoked paprika! Wow this sounds wonderful (as usual). I always love your soup recipes! I’ve always been a fan of Panera Bread’s summer corn chowder. However, I think I’ll stick to this much healthier recipe going forward. Thanks for sharing! no matter what the weather, I love soups and especially chowders. 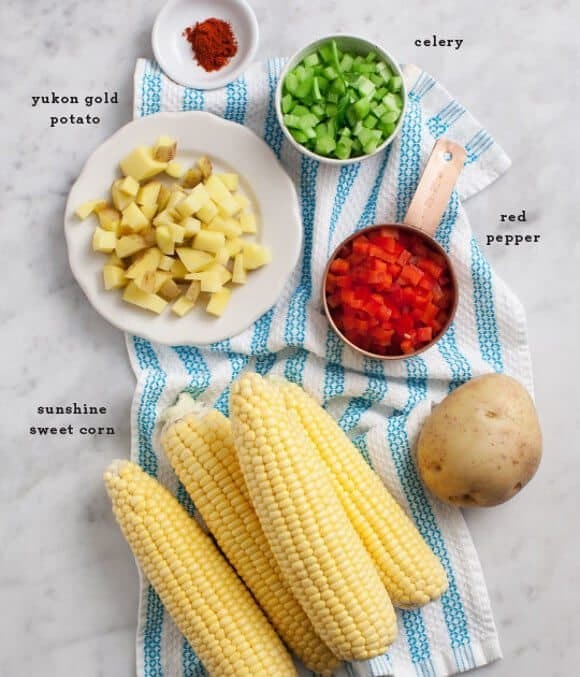 I will try this corn chowder recipe — looks very flavorful. this looks divine! Your pictures amaze me 🙂 inspiring blog! This looks so so good!! Yummy and those fresh veggies!! Want! Creamy corn is the best! My grandmother always made this, and I can’t wait to try this recipe out. So yummy! 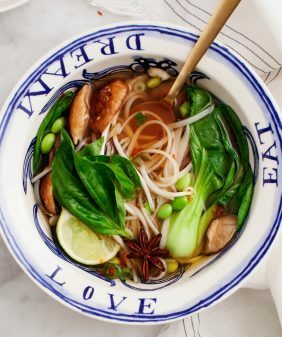 This soup is perfect for spring! Light and colorful, what a great way to celebrate the new season! Anyway on the Sunshine sweet corn website I was not able to find if their corn is GMO free ? any informations ? – Typically when you hear about GMO corn they are talking about dent corn (as opposed to sweet corn) which is used for animal feed, ethanol and other food manufacturing (corn flour, oil, chips, etc). Drooling and am now hungry thanks. Love, love, love it! What fantastic flavor! I’ve just tried this receipe an it so amazing…..sooooooooo gooooooooood ! the texture is perfect. I had a pinch of chili flakes to spice it up a bit and so good. Je viens juste de faire cette recette et elle est excellente, la texture est parfaite!!! C’est certain que je vais la refaire, elle va devenir un must à la maison! This is our new favorite soup/chowder by far. Just upped the game with new Vitamix, which brings new meaning to the creamy blended half. So good and so good for you. Thanks! This corn chowder was WONDERFUL! Such a sweet burst of flavor. Even my kids loved it. Thank you so much! This soup is SPECTACULAR. I’ve made it twice now and still can’t believe how good it is! My all time favorite soup. Thanks for the recipe. Can I make this a day ahead or would you recommend making day of? I’ll be keeping this saved in my recipe arsenal. Thanks! Does this recipe demand a dutch oven? Can I use a big soup pot instead? Would it be possible to use green pepper instead of red pepper? I’m trying to empty out our fridge and we have an abundance of green peppers but no red. Do you have a nutritional break down of all fat, carbs etc per portion (and what the portion size is)? Hi Cat, I don’t count calories, but you can find a nutritional calculator online – this serves 4-6 (depends how hungry you are, but it is a very filling soup). I was wondering if it would be alright to use Frozen Corn? 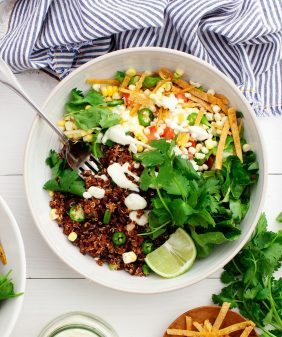 Hi Nadine, I haven’t tried, but I’m thinking it would be fine… let me know if you give it a try..
Oh I used frozen corn because there were no cobs at my grocery store. It still tasted amazing. How much frozen corn did you use? Oh my goodness. I made this tonight because my hubby was craving corn chowder, but I prefer to eat vegan…so quick google search and I found you. It was to die for!!! My inlaws (who are so far from vegan) loved it too. 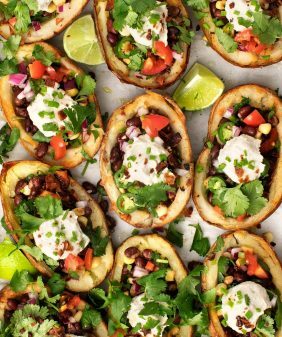 Major hit, and so easy, especially when you use leftover baked potatoes like me. Thank you!!! I’m so glad – yay! Thanks for letting me know that frozen corn worked great – corn season is so short so that’s so helpful to know! Despite it being freezing cold in Illinois right now, I made this summery soup for dinner tonight. It was wonderful and a fairly quick dinner to make! Love your blog…it’s always a go-to when trying to find new and interesting recipes. Great recipe! My fiancé and I added some habanero and cayenne pepper to spice things up. Some diced avocado puts this dish over the top! We get a vegetable box delivered once a week for our family of 6 here in Melbourne Australia. For the past couple of weeks we have been getting two ears of corn. finally we had about 10 sitting in the fridge unused. after Googling corn recipes and this being the best option for our vegetarian, gluten, dairy, egg and most nuts intolerant family! This is excellent! I have been looking for a classic vegan corn chowder and this is IT! I didn’t have celery salt so added a little saffron, and our corn wasn’t quite perfectly sweet, so I added a squeeze of agave syrup. I’ve made a few vegan corn chowders and this is the absolute best. Easy to prepare. One of those recipes that is greater than the sum of its parts, good enough for company, and easy peasy. Thank you! OMG, thank you!!! I have this simmering on the stove now and it’s absolutely amazing! I have to say that I was skeptical about using the coconut milk because I thought it would taste coconuty despite your saying that it wouldn’t. But you were bang on – no coconut flavour, just a big pot of deliciousness! I used the corn cobs to make the broth used in this chowder and I’d highly recommend it – don’t throw them out – there’s flavour in them there cobs! Toss in a pot with some water and gently boil for about 1/2 an hour. Yum! Thanks for such great vegan recipe – will definitely make again and again and again! Hi Rose, I’m so happy to hear that you loved this one! Thanks for the tip about the corn cobs! Made this great recipe. Thank you. I like to experiment so I took it to a whole another with some tarragon, galangal, and green chili powder. Wow! This is gonna be my always recipe for cream corn soup. Thanks again!!!! oh that sounds delicious – I’m glad you loved this one, thank you for the ideas! Has anyone tried this in a slow cooker/crockpot? my soup wasn’t as creamy as I would hope for a chowder. I wonder if they only puree the corn. I am guilty of eye balling measurements though. I blended half the soup so that it would thick and still somewhat chunky. Love this recipe! 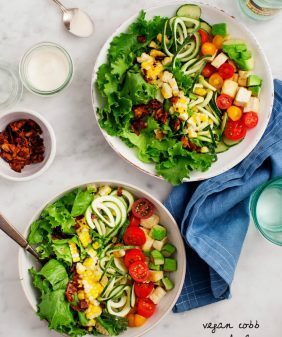 I call myself an omnivore because I love meat but i see the health benefits of eating vegetarian/vegan meals. I used this as the vegan option at a soup sale fundraiser and now it’s a permanent recipe in my binder. I did add an extra potato to make it thicker, and it’s so loaded with veggies I used water instead of the broth. Didn’t notice a difference. 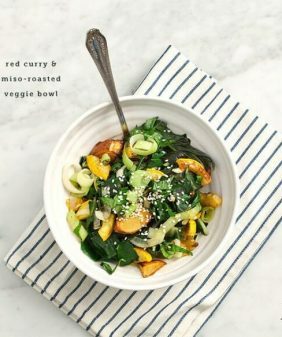 After recently adapting a plant based diet my husband and I were thrilled to find this recipe. I love to cook and need to start an arsenal of great recipes to add to my cooking repertoire. The recipe was shared with my by a local café that makes a similar version which I had not tried. Ever since I saw the recipe I knew I wanted to make it and we were completely thrilled with the results! My husband said this chowder tasted good enough to be served in a restaurant! To me, the soup tasted almost like a seafood chowder/bisque broth. I followed the recipe with ingredients and as a substitute for celery salt I used a 1/4 tsp celery seed and 1/4 tsp salt to equal the 1/2 tsp of celery salt. The smoked paprika really gives this soup a nice smoky smell and flavor, I added the spices and sautéed for a minute or so, just after my onions were sautéed, to pull as much flavor out of the spices before adding the other ingredients. I pureed have if the soup with an immersion blender. Never knew plant based eating could be so flavorful and down right delicious! I’m so so happy to hear that you and your husband loved the chowder! Thanks for coming back to let me know!! I made this last night and was thrilled with the results. It let’s the corn take center stage without being under-seasoned, and the coconut/corn combination is so natural that you don’t feel this is a substitute corn chowder–it stands on its own. Best of all, since the focus is on the corn, the recipe doesn’t have dozens of ingredients and can be made quickly. This will be in heavy rotation in my house! Thank you! Thank you Jessica! I’m so happy you were thrilled with the recipe! I’ve made this a couple of times and love it. I added carrots because my little one loves carrots. And it was great!! It’s a hit with the whole family even my very picky toddler. This was really good but my version came out almost too sweet. The corn was really good local corn so maybe that is why. I also didn’t have the celery salt so maybe that’s the culprit. I thought it delish with no stomach ache afterwards so that k you thank you thank you. If your sweet corn was really great, that might have been the issue since there’s no added sugar here (although that’s great that you had such good corn!) The celery salt would definitely deepen the flavor – if you don’t have it, I’d try just adding more salt to taste. Kinda defeats the purpose to review by looks. Has anyone actually tried this? If you skip the first few comments on this thread, you’ll see that nearly everyone else who left a review made it. Thanks! 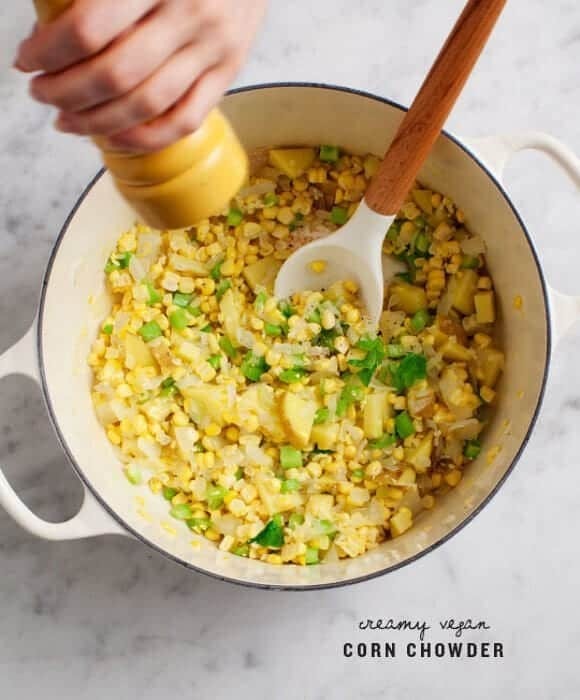 Amazing creamy vegan corn chowder! It looked soooo good, I had to try and make it. I used your suggestion and used ½ teaspoon celery salt. Oh my! This was delicious – and so easy to make! Thanks so much! Definitely your creamy vegan corn chowder is awesomeness! This is a great recipe Jeanine, as you know I made it a short while ago and it was lovely, in fact have made it again since. Thanks for sharing! Has anyone tried this with regular (not light) coconut milk? If so, does the flavor become too coconuty? I used full fat coconut milk and it was great. I’ve made corn chowder multiple times but this was the best version yet. I’m so glad you loved it, thanks for your notes!! Thanks, this was a really tasty recipe. My baby and 4 year old enjoyed too. Perfect soup for a cool rainy day. This chowder is delicious & my favorite !!!! Hi Tracy, I”m so happy you enjoyed it! If I had to use frozen corn, any idea how much? I’d use about 3 cups – hope that helps!